Wednesday, September 28 will be a special day during the DVD drive—organizers will be pushing the Text2Give campaign. 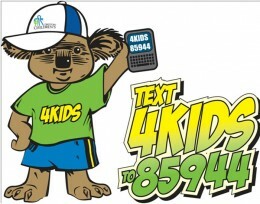 Donors will be invited to text “4KIDS” to 85944. They will then receive a confirmation text, to which they must respond “yes.” A donation of $10 will be added to their cell phone bill. Imagine you’re a kid at Dayton Children’s Medical Center stuck in bed after a surgery. You can’t play with your friends. You can’t visit with other patients or even walk around your room. What is there to do? Well, at Cincinnati and Dayton Children’s hospitals, the staff hopes to provide bedridden children with DVDs and video games to make their time stuck in bed easier to pass. Unfortunately, funding for this kind of endeavor is limited, and the hospitals’ stashes of entertainments are quickly being drained. “The DVDs and the games are leaving at a rate that’s faster than they can replenish,” said Rachel McClain, the director of campus recruitment at Northwestern Mutual–Miami Valley. “A lot of times they’re broken, they’re lost, they don’t work anymore.” Or, said McClain, because the Children’s hospitals give patients so many gifts, sometimes kids think they can take the DVDs home. Northwestern Mutual was approached by Cincinnati Children’s Hospital Medical Center earlier this year to create a fundraiser to benefit their DVD and videogame program. McClain, a Wright State University alumna, contacted the Greek communities at Wright State and University of Dayton to get local colleges involved. Collection bins for kid-friendly DVDs and Playstation 2 games will be set up on Wright State’s campus Sept. 26–30. There will be bins in the Student Activities office and the Greek affairs office, and a team will be on the quad on Tuesday and Thursday from 11 a.m. to 4 p.m.
Wednesday will be a special day during the DVD drive—organizers will be pushing the Text2Give campaign. Donors will be invited to text “4KIDS” to 85944. They will then receive a confirmation text, to which they must respond “yes.” A donation of $10 will be added to their cell phone bill. McClain said that when Children’s Hospital get funding from an outside source the money typically goes to state-of-the-art-equipment. “Things like DVDs often go unnoticed,” she said.